Club Penguin Cheats by Mimo777 Club Penguin Cheats by Mimo777: Rockhopper Reviewed By You! "If I could spend a day with Rockhopper we would swim with the fishes and sunbath on a rock and get out our picnic hamper to see what goodies it held, then we could go on a boat and do some fishing followed by scuba diving and lastly swim with the dolphins." Sweet! 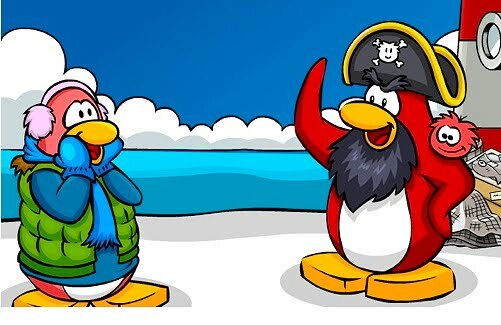 Hanging with Rockhopper is awesome! Good job Squeaky5066! Next week Club Penguin wants to know our ideas for an ultimate Field-Op. What would we do to keep the island safe? Hmm, good question. I would love to hear your ideas! Hey Mimo what about the Caption Contest? When will you announce the winners of that? That HAS been a while! I'm sure Mimo is working on it! We havn't heard from YOU in a while now have we. Yea, maybe soon. Mimo might be still working on it. Getting the finishing touches in. I liked their 'I would do this with RH...'. It's cool! Thanks for your congratulations! Keep on commenting! Warmest Wishes and coldest Fishes! i dont get it... how do you activate the antenna? thnaks again for keeping me up to date! ;) great work u guys u rock! !